WILLIAMSTOWN, Mass. — When it comes to Georgia O'Keeffe, there is popular history and there is academic history. To the general public, she is a charter member of the American modernists, the woman whose student drawings prompted famed gallerist-photographer Alfred Stieglitz to say, "finally, a woman on paper," whose physical beauty captured Stieglitz's camera and heart and whose erotically charged abstract flowers are objects of delight. Art historians know the story is much more complicated. O'Keeffe was a reluctant modernist at first. She knew the art of her most famous teacher, William Merritt Chase, was doomed. But she disliked the cubism of Cézanne, whose works were stirring the pot in New York's art world. Then, encouraged to look at the pictures but not the text in Arthur Jerome Eddy's "Cubists and Post-Impressionism," O'Keeffe drew inspiration from a work by Arthur Dove, an artist who aspired to be a farmer but who nevertheless made the first abstract painting in America, if not the world. What she saw -- his "Based on Leaf Forms and Spaces," 1911-12 -- is now lost. 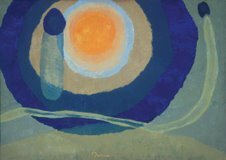 But as O'Keeffe recalled when she was in her 70s, "It was Arthur Dove who affected my start, who helped me to find something of my own." "Dove/O'Keeffe: Circles of Influence," at the Sterling and Francine Clark Art Institute here, is the first exhibition to explore their relationship. But what's important is not that visitors learn art history. It's that they see for themselves the way these two artists inspired each other over more than three decades and, more important, that they discover, or rediscover, the extraordinary, underappreciated Dove. Despite the popular reputations of O'Keeffe and Dove, or lack thereof, Dove emerges as the far more daring, more imaginative artist of the two. He, not she, tries collage, putting blue chiffon over metal with sand to make a serene "Sea II" that exceeds her wildly abstract "From the Lake No. 1." He, not she, creates works such as "Fog Horns" that evoke sound. And he, not she, never looks back at figuration, but turns out works that are increasingly spare, abstract and yet incredibly lyrical. His works are both more layered, literally and figuratively, and more nuanced. Even so, Dove draws on O'Keeffe's work, too -- first trying watercolors in 1930 when he recalls the "burning watercolors" O'Keeffe exhibited in 1917, for example. The exhibition starts with two bold, explicitly phallic images -- O'Keeffe's "Jack-in-the-Pulpit No. VI" from 1930 and Dove's "Moon" from 1935 -- whose dates reveal the two-way "symmetry of influence." Dove's early abstractions appear in the first gallery, showing O'Keeffe the way to "Blue I," from 1916, a departure from her student work. Painted about two years after she sees her first Dove, in the book, it's one of her fully resolved abstractions from the period. She is still searching, however, painting nudes in blue watercolor and abstractions such as "Red and Blue No. II" that don't quite work. From there, Debra Bricker Balken, an independent curator specializing in American Modernism and contemporary art, unfolds the narrative more or less thematically, using 60 paintings, watercolors, drawings and collages from 1910 to the 1940s. Over the years, O'Keeffe and Dove dealt with similar subjects, capturing the experience of nature -- the heat of the sun, the waft of the wind, the feel of a stream -- and the human response. Both employed sensual and sexual imagery. Both were tagged with Freudian interpretations in the 1920s, especially by Paul Rosenfeld, who wrote that while Dove exhibited "virile and profound talent," his "complement" O'Keeffe made art that was "gloriously female," a characterization O'Keeffe rejected. While covering those subjects, the show sticks tightly to its thesis, and Ms. Balken's choices and pairings of works are the key to its brilliance. Viewing two comparable paintings, side by side, you see the direct connections in theme and style as well as the differences. The dates suggest who influenced whom -- but then you ask, which is stronger? In 1926, for example, O'Keeffe painted "City Night," a beautiful Sheeler-like landscape with towering black buildings leaning toward one another, almost clashing, and -- at the bottom of the painting -- a bright white moon shining through the gap. Four years later, Dove responds. In his "Silver Tanks and Moon," silvery white industrial tanks loom over most of the canvas, rendered in feathered brush strokes of oil and metallic paint. At the very top, a tiny yellow moon draws the eye, its aura pierced by a brooding cloud. Almost a mirror-image negative of O'Keeffe's work, Dove's makes hers look conventional. Of course some of this is in the editing and may be unfair. 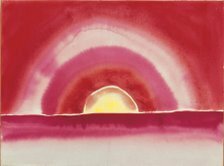 In 1916, O'Keeffe made a gorgeous little watercolor, "Sunrise," showing a yellow half-moon sitting on a red horizon amid a red sky. Nearby, Dove's 1936 "Sunrise I," whose sun is a great ball of fire, surrounded by deep blue and floating above a curved horizon, outshines it. O'Keeffe made other works of the sun, though, that do rise to Dove's creativity level -- her "Evening Star" series from 1917, for example. And some pairings, his "Sea Gull Motif (Sea Thunder or The Wave)," 1928, and her "Dark Iris No. 2," 1927, are too close to call. Both are simply a pleasure to see. Therein lies a tale. Ms. Balken, who curated the 1997-98 traveling retrospective of Dove, probably favors him. But after viewing the exhibition, I asked her about her aspirations for the show. "I'd be delighted if viewers were confounded as to 'who's Dove?' and 'who's O'Keeffe?'" she said. At times, they will be. The one shame of this show is that it will not travel. You have to go to Williamstown to see it. I highly recommend that. See more pictures and a bit more information here. Click on the Wall Street Journal link, at top, for a slide show of additional works.